Barack Obama delivers his State of the Union address to a joint session of Congress on Capitol Hill in Washington, DC, January 12, 2016. RBTH presents a selection of views from leading Russian media on international events, featuring reports on what President Obama said about Russia in his State of the Union address, threats of renewed sanctions faced by Russia’s delegation to PACE and what Russian oil companies are doing to prepare for sustained low oil prices. 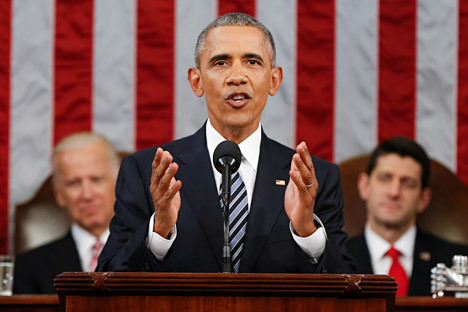 On January 12 U.S. President Barack Obama delivered his annual State of the Union Address to a joint session of the U.S. Congress. According to some in the Russian Federation Council, U.S. policy during Obama's tenure has been unsuccessful. In the opinion of First Deputy of the Federation Council Committee on International Affairs Vladimir Dzhabarov, having the most powerful economy in the world does not guarantee America a victory in all conflicts. The Izvestia daily broadsheet writes that the renewal of sanctions against the Russian delegation at the session of the Parliamentary Assembly of the Council of Europe (PACE), which will take place January 25-29 in Strasburg, might receive support from Sweden, Lithuania, Estonia, Poland and the UK. A source in the assembly's secretariat initially made the statement, adding that the delegation's authority will be restricted even if it does not participate in the session. The Russian delegation told Izvestia that in such a case Russia would stop making payments to the Council of Europe, a sum whose value, depending on the exchange rate, might be over RUB 1.6 billion (approximately $21 million). A report concerning the potential restrictions on the Russian delegation to PACE’s authority originally appeared in the German Deutsche Welle state run international broadcaster. According to the publication, because of the continued controversy surrounding Crimea and the war in the Donbass the assembly's deputies may contest the Russian delegation's authority on the first day of the session. The first time the Russian delegation to PACE had its authority restricted in a serious manner was in 2014. In January 2015 the delegation participated in the PACE session, but left after the extension of the sanctions. At the beginning of 2016 oil prices continued their fall: on January 12 the price of Brent Crude slid below $31 a barrel. The RBK business daily cites UBS analysts who say that this will be the price throughout the first six months of the year, while Standard Chartered analysts believe that prices may fall to $10 a barrel. For now the Russian Energy Ministry is preparing estimates for operating with a price of $30. In December 2015 the ministry asked the country's largest oil companies to carry out a stress test for $30-a-barrel conditions. The ministry and the companies' representatives are not disclosing the results, however, oil company officials and analysts believe that the level of $30 a barrel is not critical and that oil producers can withstand even lower prices. In the words of Rosneft Press Secretary Mikhail Leontyev, the company has a stress scenario based on the $30-a-barrel price. With this price the company will continue to implement even its shelf projects. In December Alexander Dyukov, president of Gazprom Neft, told Rossiya 24 TV Channel that the shelf deposit in Prirazlomnoe will still be profitable even at a price of $25 a barrel and that the company as a whole will still be making profits even at a price of $18-20 a barrel. Russia's largest oil companies will not be experiencing losses even at a price of $15 a barrel, said Ildar Davletshin, an analyst at Renaissance Capital.